Ohio Gov. John Kasich took what clean energy proponents deemed retrograde executive action last week, putting the brakes on Ohio's clean energy drive. In 2008, Gov. Kasich signed Ohio's Renewable Portfolio Standard (RPS) into law, requiring utilities by 2025 to obtain 25 percent of their electricity from alternative energy resources, and at least 12.5 percent from renewable energy resources. On Friday June 13, Kasich enacted Ohio Senate Bill 310 (SB 310), which freezes renewable and energy efficiency drive for two years. Gov. Kasich and the Ohio state legislature followed that up by “abandoning $2.5 billion in wind energy projects,” according to the American Wind Energy Association (AWEA). This past Monday, June 16, Ohio's governor signed House Bill 483 “without vetoing a last-minute insertion that requires wind turbines to be at least 1,300 feet from the nearest property line instead of the nearest house,” AWEA explains in a news release. HB 283 was passed without “the regulators at the Ohio Power Siting Board, nor a single wind company operating in Ohio” given the opportunity to comment or provide testimony regarding the issue, which made its way through the state's General Assembly in just one week. Meanwhile, passage of SB 310 makes Ohio the first state to renege on its RPS. As a result, Ohio's renewable energy mandate will remain at 2.5 percent and its energy efficiency standard at 4.2 percent compared to 2009 levels for the next two years. Strong opposition to SB 310 was voiced from a variety of interest groups -- large manufacturers as well scientists and those doing business in Ohio's growing renewable energy and energy efficiency sectors, according to a report from Columbus Business First. “Proponents say the market has changed since the bill was signe and that they aren't killing renewable standards, but simply want to study them,” Columbus Business First reporter Tom Knox writes. The freeze comes at an inopportune time. Critics point out that it will make it all the more difficult for Ohio to meet the Obama administration EPA's proposed Clean Power Plan, which was published in the Federal Register on Wednesday. “Gov. Kasich has walked away from his commitment to renewable energy. He and the legislature are creating an unfriendly business environment in Ohio. Furthermore, AWEA points out that Ohio's previous wind turbine siting requirements were among the most restrictive in the nation. The change from 1,300 feet from the nearest house to the nearest property line was “added to the state budget bill only after all public debate had already ended,” AWEA notes. “If fully developed, the current projects could have provided approximately $220 million in local tax payments and $180 million worth of leases to landowners over the projects' lifetimes. With stable policies, those numbers could have steadily grown in the coming years,” the AWEA asserts. What prompted the abrupt and sudden political reversal of fortune? Difficult to say. Coal has played a big role in Ohio's economy. 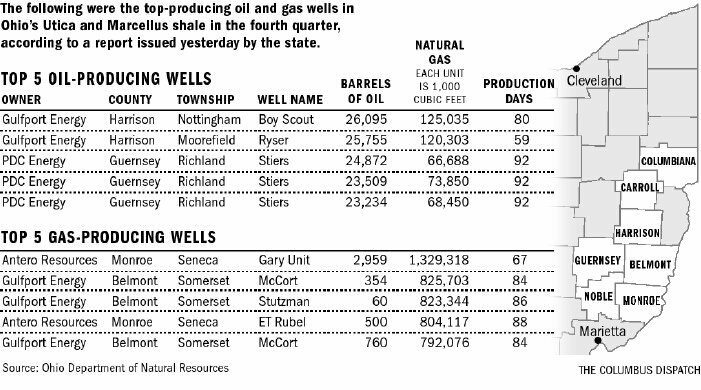 More recently, hydraulic fracturing ("fracking") of the Utica and Marcellus shale for oil and gas has been expanding rapidly along with a coincident rise in earthquakes and concerns regarding water contamination and use. Renewable energy appears on the outs, but “Drill, baby, drill” is alive and well in Ohio.